Synthetic peptide corresponding to Human Nucleophosmin aa 23-38. Synthetic peptide corresponding to Human Nucleophosmin aa 226-240. HeLa or mouse fibroblast extract. Our Abpromise guarantee covers the use of ab15440 in the following tested applications. ICC/IF 1/100. Used at a dilution of 1/100 (see Abreview for further information). WB 1/500 - 1/1000. Detects a band of approximately 38 kDa (predicted molecular weight: 33 kDa). Western blot analysis of various cell lines (25ug/lane) labeling Neucleophosmin with ab15440 at 1/500. A HRP-conjugated goat anti-rabbit IgG (1/20000) was used as the secondary antibody. ab15440 detecting Nucleophosmin in interphase mouse primary embryonic fibroblasts. Cells were also counterstained with anti gamma tubulin antibody and DAPI in order to highlight the centrossomes and the nucleus (respectively). Secondary antibodies: goat anti-rabbit IgG conjugated to Alexa 488 (for ab15440) and goat anti-mouse IgG conjugated to Alexa 594 (for gamma-tubulin antibody). ab15440 detecting Nucleophosmin in mitotic mouse primary embryonic fibroblasts. Cells were also counterstained with anti gamma tubulin antibody and DAPI in order to highlight the centrossomes and the nucleus (respectively). Secondary antibodies: goat anti-rabbit IgG conjugated to Alexa 488 (for ab15440) and goat anti-mouse IgG conjugated to Alexa 594 (for gamma-tubulin antibody). 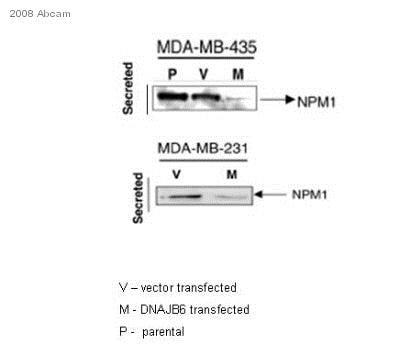 ab15440 staining human purified nucleophosmin from concentrated secreted serum free medium. 15 µg of purified protein were loaded in to each lane. The primary antibody was diluted 1/500 and incubated with the blot for 15 hours at 4°C. A HRP conjugated donkey anti-rabbit IgG antibody, diluted 1/5000, was used as the secondary. ab15440 (4µg/ml) staining nucleophosmin in human colon using an automated system (DAKO Autostainer Plus). Using this protocol there is nuclear staining. Immunohistochemistry was performed on both normal and cancer biopsies of deparaffinized human kidney tissue. To expose target proteins, heat induced antigen retrieval was performed using 10mM sodium citrate (pH6.0) buffer, microwaved for 8-15 minutes. Following antigen retrieval tissues were blocked in 3% BSA-PBS for 30 minutes at room temperature. Tissues were then probed at a dilution of 1/500 with a rabbit polyclonal antibody recognizing Nucleophosmin (ab15440) or without primary antibody (negative control) overnight at 4°C in a humidified chamber. Tissues were washed extensively with PBST and endogenous peroxidase activity was quenched with a peroxidase suppressor. Detection was performed using a biotin-conjugated secondary antibody and SA-HRP, followed by colorimetric detection using DAB. Tissues were counterstained with hematoxylin and prepped for mounting. Publishing research using ab15440? Please let us know so that we can cite the reference in this datasheet. I have a customer enquiry about B23/nucleophosmin antibody for formalin fixed brain tissue. They are wanting to see evidence of successful use of an Ab with formalin fixed human brain tisue. The answer you have provided to customer is very well structured. Perhaps you could also tell customer, that the information or data Abcam has about these products is already on the datasheet, they do not hold any more data than this. Please forward the following link to customer (http://www.proteinatlas.org/ENSG00000181163/normal). It shows the target is expressed in brain. Thank you so much for the help, I too am sorry that nothing has worked. I am trying to decide on a secondary antibody or a different primary. I thought that maybe you could help with one other question. Have you ever heard of anyone who has performed a successful double stain (2 different colors) but had the same primary antibody species? I was wondering if I first stain with B23 and use a FITC secondary to mouse, then can I use the next mouse antibody to my other protein followed a different secondary with Texas Red or Rhodamine? Thanks for the help!!! Thank you for your enquiry. You can do the experiment that you are describing but the primary antibodies must be of different isotypes. I have seen this experiment work best when you have one mouse antibody that is IgG and another that is IgM, and then you use an anti-IgG secondary and then an anti-IgM secondary. I do not believe there are any secondary antibodies that are specific for IgG1 versus IgG2, so you would have to do IgG versus IgM. I hope this information helps, please do not hesitate to contact us if you need any more advice or information. I'm sorry to hear you are having a problem with ab15440. Thank you for your patience in waiting for my reply. It is difficult for me to determine at this point if the lack of staining is due to the primary or secondary antibody, or if the protocol could be adjusted to have success with the antibody. We have not had any complaints about the secondary or primary so it is difficult to determine. Since ab15440 is working in Western blot I am wondering if either the protocol needs to be adjusted or if the secondary is causing a problem for you. Immunofluorescence was added as an application because of the following review that a customer submitted: Sample Mouse Cell (embryonic stem cells) Application Immunocytochemistry/Immunofluorescence Blocking step: Serum as blocking agent for 2 hour(s) 0 minute(s) · Concentration: 10% Fixation: Paraformaldehyde Antigen retrieval step: None Incubation time: 12 hour(s) 0 minute(s) Dilution 1/100 Rating Good - I would definitely use it again Secondary antibody Name: Non-Abcam one was used: Alexa 568 Conjugation: do not use Dilution: 1/1000 The only major differences are that the review customer fixed the cells in paraformaldehyde, the primary incubation was overnight at 4 degrees, and the secondary was different. I would like to suggest the following modifications to your protocol: 1) Please use paraformaldehyde as a fixative instead of methanol:acetone as antibodies can be sensitive to the fixation time and method, 2) More importantly, please incubate in primary overnight at 4 degrees if you have not already done so, 3) Please confirm whether you have used the secondary with another primary to know that the secondary is giving you good results. Alternatively, please try a different secondary in IF so we will know if the secondary is causing the problems for you. Please let me know if this helps and do not hesitate to contact us for further advice. Hi I would like to use this nucleophosmin (NPM) antibody in a western application. What positive control would you recommend? If you have a commercial one avialable I would like to purchase it. I am probing human umbilical endothelial cell lysate. Thank you for your enquiry. Our recommended positive control for our Nucleophosmin antibody (ab15440) is a HeLa or mouse fibroblast extract. I would recommend our HeLa (Human epithelial carcinoma cell line) Whole Cell Lysate (ab7898). I hope this information helps, please do not hesitate to contact me should you require further assistance.